If you’re like me, you don’t like to rush out of the park as soon as the fireworks are over. Sometimes I like to eat late or would love to relax with a refreshing beverage while waiting for the crowds to clear out. Disney thinks there may be others like me and are running a trial of an “extra hour” program at a few Epcot restaurants. From March 28 through April 10 you can book an “extra hour” table at Coral Reef, Garden Grill or Le Cellier. Sit and enjoy a meal, cocktail or dessert while the crowds leave. I think it’s a great idea, let me know what you think and if you book it. By the way if you stop at Le Cellier for dessert; the maple creme brulee is a favorite among half of my family while the chocolate lovers (me) highly recommend the chocolate whiskey cake. It’s fall, that means time to trick or treat! A great place to trick or treat is at the Magic Kingdom when you go to Mickey’s Not So Scary Halloween Party. 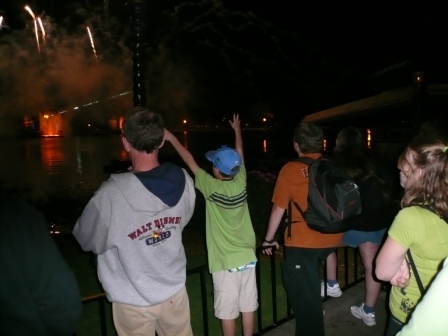 Wear your costume, get ton’s of candy, ride the rides and see a special parade & fireworks! Lot’s of fun for everyone! When we came out of Toy Story the Musical, Captain Jack Sparrow was out, posing for pictures and causing trouble. Captain Jack is always causing trouble…. Jason met and had his picture taken and then as Megan went, Captain Jack walked across the hall and grabbed a teddy bear from the shop. He liked “Teddy” had his picture taken with Megan, then with Meg & “Teddy” and then declared to the photographer “Just Teddy”. Teddy was placed on the floor and had his picture taken. This story may not translate to screen well, but I just have to say that Captain Jack is quite the Character! Growing boys need to eat, frequently. We had an hour till dinner and Jason was starving. 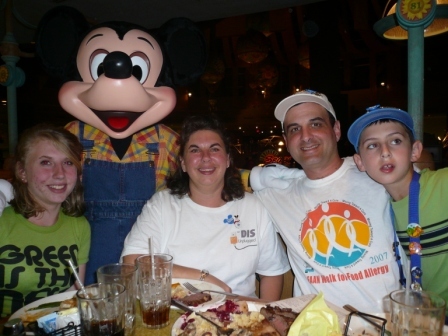 This is where cruising is great for families with teen/tween kids; there’s always food available! We sent Jason off to get some pizza and told him to be at dinner at Animators Palate on time. Jon, Megan & I decided to wander around the ship a bit. We checked out the shops, wandered on deck, those of us over 21 enjoyed a before dinner cocktail. When we met up, Jason was all sweaty and pretty gross. I don’t know how you get that sweaty eating pizza……oh that’s right; he ate the pizza then went and played more soccer! I showed him where the restrooms were so he could clean up before dinner and that is when Megan had her 2nd Captain Jack Sparrow experience of the evening. Meg was looking at the photo pass pictures when Captain Jack came in; he was actually going “off stage” and was done with pictures but when he saw her standing there he said he needed ‘a picture with the pretty girl’. They posed for the camera and then someone tells Captain Jack that “a giant rodent is coming” . With that, Captain Jack yells “every man for himself!” and dives through the cast door. A minute later, Mickey Mouse the “giant rodent” walked by. Tonight we’re eating at Animator’s Palate. This is a neat restaurant. The entire place, servers uniforms included; is black & white. The artwork, animation cells, everything is black and white; at least that’s how it starts. Over the dining period, the room begins to colorize and gets brighter. I won’t spoil the “finale” of the show, but it’s very cool. Onto the food. This was actually the meal that I was least looking forward to, it’s not bad it’s just not “wow”. The choices are a little boring….I do recommend the Ahi Tuna Tartare, the wasabi cream is very good! The phyllo wrapped salmon is very good, but you can’t get the salmon cooked rare because of the phyllo. We all ate our meals, but none were memorable. We ordered our desserts, Jason was in a hurry to leave to catch a program at the Oceaneers Lab before the Pirate Party. I knew that tonight they were going to recognize our anniversary, so I didn’t want him to leave too soon. Right before dessert was served, I saw them getting ready. A beautiful cake was brought over, along with 2 glasses of champagne and our head server announced our celebration, they sang to us and it was very nice. Our head server then came and apologized about the misunderstanding the night before. They may have messed up last night, but they more than made up for it tonight! The cake was wonderful, and we had enough left that they packed up for us to take back to the room for later. Jason had his dessert and took off for the kids club. He wasn’t interested in the Pirate Party, he had soccer & flubber plans for the night. We took the cake to the room, and then went up to deck 9 for the Pirate Party. I know Jon had his doubts about the Pirates in the Caribbean Party, but when we got up on deck the music was playing, the dancing and singing started he changed his tune. The party starts as a fun celebration and then “pirates” board the ship and take over, turning things a little darker. In the end, Mickey saves the day and then there are fireworks. Yes! Fireworks are shot from the ship out over the water. Disney is the only cruise line to do this, and it’s amazing!!! After the fireworks, the music continues and the evening Pirate Buffet is set up. Still full from dinner, we weren’t ready to eat again. Besides, it was almost time for Krazy Karaoke. Meg took off to Aloft, they had big plans for the night. We stopped by the sports deck to make sure Jason hadn’t forgotten about the Flubber activity….ooops good thing we stopped by, he’d lost track of time. Now that the kids were settled with their plans for the night, Jon & I were ready for our night “out”. We headed to Wavebands down on Route 66 for Krazy Karaoke. There’s a huge song list, you sign up, get called up and when you’re done singing you get a shot. I’m of the opinion that if you want me to sing in front of people, you should give me the shot 1st! Jon signed up and sang to me for our anniversary. He picked a Harry Connick Jr song that he knew I loved and the whole crowd got into it. When he was done he had Pikey (our host) give me the shot. This time it was blue, last month it was purple….gotta say the blue tastes better. I know Jon really wanted me to sing, but I’m a scaredy cat and just couldn’t bring myself to do it. The other highlight of the evening at KK (besides Jon singing to me) was when Cody (Hannah Montana’s show brother) got up to sing and started rapping. He was a riot! He was sitting next to us and was a really nice guy and a lot of fun. After KK, we sat at Cadillac Lounge for a bit and then came back to Wavebands for some fun dancing. It was fun for awhile and then we decided to go somewhere quieter. We caught up with Jason back in the stateroom and he was, hungry. Shocking! A friend had told me before my last cruise to order Mickey Bars from room service, she swore they taste better. This seems like as good a time as any! I wanted a little something else, so I called and ordered the Mickey Bars and the fruit/cheese plate. Again they told me it would be 30-40 minutes, and the knock on the door was actually 10 minutes later. I have to say, my friend was right. Nothing beats eating room service Mickey Bars on the verandah at 1:30am! Just after we finished our midnight snack, Meg returned, glowing from her night at the teen club. Busy day, but it was a lot of fun! Tonight (this morning??) I’ll be smarter and put the room service breakfast order on the door. Starting the morning with coffee in the room would be a good idea! I planned our Candle Light Pocessional dinner package at Garden Grill for a few reasons. We’ve had several good meals there in the past and the food was pretty “safe” for Dad. For those that haven’t been, you don’t order (other than your drinks) there is a set meal that is brought out family style. Biscuits & rolls (no more orange honey butter ) salad and the main course: Turkey w/cranberry relish, Flank Steak w/Mushroom Cabernet au Jus, and Fried Catfish, served with homestyle potato casserole and selected fresh vegetables. We had a good meal, our server was allright, but not great. We never got biscuits (the table next to us did) the kids food I requested took awhile to come out (kids menu is also all you can eat, chicken strips, fries & stouffers mac&cheese) This is a character meal, Farmer Mickey, Pluto, Chip & Dale. We had a lot of time with the characters, saw each of them twice and got great pictures! Dale swiped DS’s hat right off his head and took off with it, then held it up higher than DS could reach. Pluto seemed quite taken with Jackie, and seemed to be trying to take her away from Dad. The funny part of the meal was when DD spilled her whole glass of Coke on Dad & Chip. Funnier for me than DD, Chip or Dad. We finished dinner with a caramel apple dish. I don’t remember the exact name, but it was good. DS could have had a cupcake, but decided he was full. It was a pretty fun meal! Now remember back to Wednesday morning and I was confused about Dad & Jackie having breakfast at the Studios? Well they admitted later that day that they thought they “might have screwed up”. They had breakfast at Hollywood & Vine with Dora the Explorer . No, that wasn’t Dora, wrong park/COMPANY you actually had breakfast with the Little Einsteins; and well, yes, you screwed up. Now you’ll have to pay out of pocket for dinner tonight (which if they had really wanted that Hollywood & Vine breakfast, I’d have told them to pay out of pocket for that since it was cheaper ) Oh well, not my fault. They’re grownups, although I spent the week feeling like they needed more supervision than my 14 yr old, lol. We got our passes for the Candle Light Processional from our server and then walked around World Showcase to work off dinner. 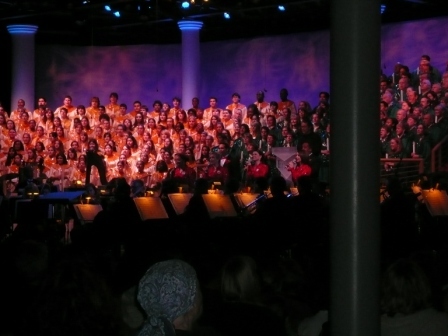 I have always heard wonderful things about Candlelight Processional and how it’s a “don’t miss” event. I’ve always wanted to go, but the kids were so much younger on our past Christmas trips that I didn’t think they’d sit through it. I know our passes guarantee us seats, but OMG the line is sooo long! I really didn’t know how they were going to get everyone into the the theater, but once they started, everyone was in in no time flat. Disney is certainly the King of crowd control! We’ve got good seats, a really nice gentleman in front of us telling us what to what/look for (sign language interpreter is in front of us and amazing to watch!) Our Narrator tonight is Edward James Olmos (Lt Castillo in Miami Vice, Justice Mendosa, West Wing, Commander Adama in BSG) Wow! Wow! Wow! This was truly an amazing experience. The choirs were fantastic, the orchestra & Conductor were amazing and the Signer, you could feel the music in his signing. He emoted every bit of every piece of music. It was beautiful. If I lived nearby, this would be my Christmas Eve tradition. Since I don’t, it’ll just be a “must do” every Christmas trip from now on. 9:15pm, only 15 minutes till Holiday Illuminations. Our time with Dad & Jackie is just about over. We walk towards Germany and get a great spot for the fireworks. “Dad, stand here with the kids. The show starts in a few minutes and we’ll be right back”. I’m telling you, ADHD. He starts walking off. UGH! STAY! My kids follow directions better! DH & I go for a beer from Germany. The line is slow and Illuminations is about to start, so I walk back to Dad & the kids and now Jackie is missing. Dad said she went to the ladies room and hasn’t made it back. Well, we are directly in front of the restrooms in Germany. She couldn’t have come out and not seen us. DH makes it back, but still no Jackie. Good thing I know Illuminations by heart, I go check the ladies room, no one there. Come back and a few minutes later Jackie appears. Seems she spotted a shop and had to have a quick look. The weather is beautiful, DS is “conducting” the fireworks (hilarious picture) the holiday ending is a magical ending to our evening. We say our good-byes, (bell services will be picking Dad & Jackie up at 4:15 am ) Wow, I can’t believe it’s over. I really hope/think they enjoyed their trip. Thankfully we still have another day left. It’s a shame this isn’t video, just imagine his arms moving all over the place!